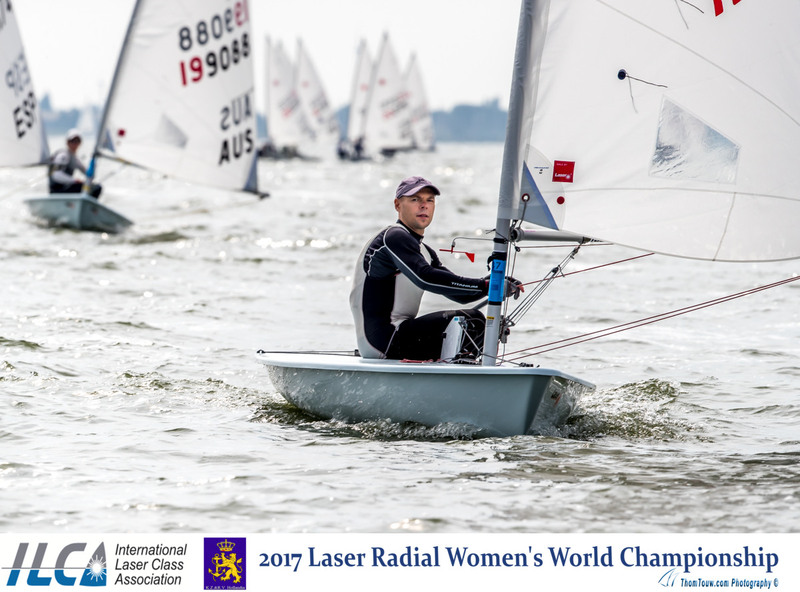 (Medemblik, Netherlands) – The second day of Laser Radial World Championships brought sun and 6-8 knots of breeze for all three fleets to complete two races. Yesterday’s racing in difficult, light wind highlighted different sailors in each race, and the same applied today with new names at the top of the leaderboard. In the white fleet today, the most notable performance was that of Australia’s Mara Stransky. 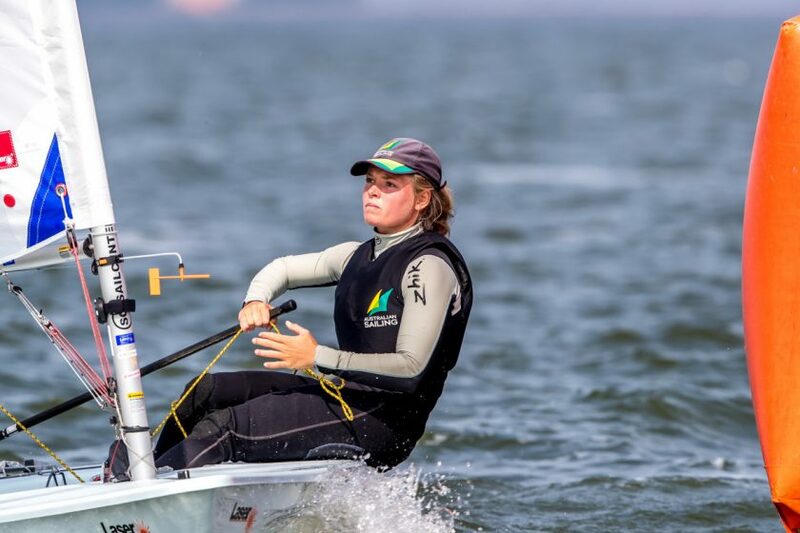 After a general recall, the white fleet started Race 3 and Mirthe Akkerman (NED) shot out to the front by the first mark, where Stransky was around 10th. 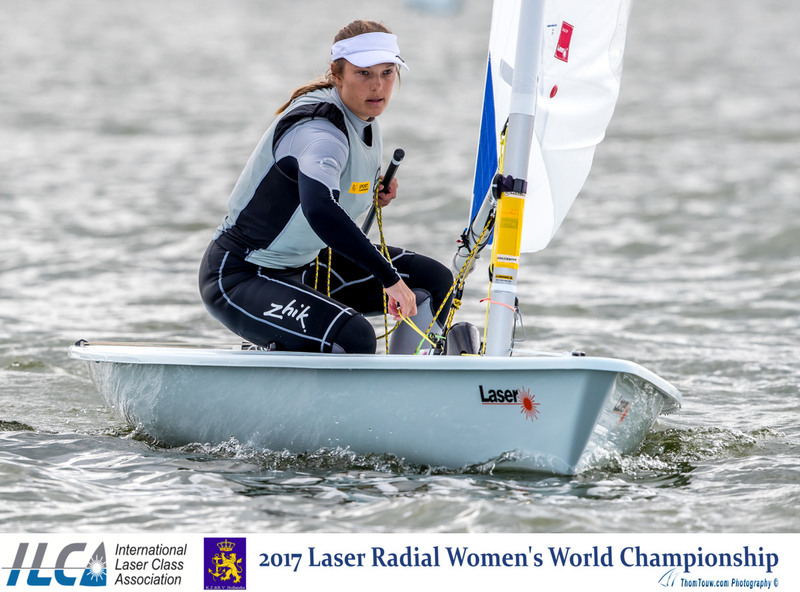 But she slowly chipped away at the fleet and sailed into second place behind Akkerman, with Evi Van Acker (BEL) securing third far ahead of the fleet. In Race 4, Stransky held her first place position around the entirety of the course and by the final reach, she had created a very established win for herself. Manami Doi (JPN) worked her way into second place with Agata Barwinska (POL) tailing in third. The yellow fleet set off on Race 3 after a clean start, and began to spread out by the first mark with Pauline Liebig (GER) rounding in first. Josefin Olsson (SWE) followed behind with Marit Bouwmeester (NED) on her tail. The three women held their positions out front, but Olsson managed to sail past Liebig and create quite a distance between herself and the other two. Liebig and Bouwmeester claimed second and third respectively. Great Britain was in the vanguard for Race 4, with Rheanna Pavey heading the fleet and Alice Woodings Hyde maintaining second until the final downwind. Isabella Bertold (CAN) overtook Hyde and sailed into second across the finish line, but Great Britain claimed a first and third. In the men’s fleet, there were a few more general recalls, but eventually two races were completed. In Race 3, Zac Littlewood (AUS) took off with speed leading the fleet on the first downwind, but Poland’s five-time World Champion, Marcin Rudawski passed Littlewood on the second upwind and sailed to the finish by a wide margin. Alfonso Fernández (ESP) took second place with Littlewood in third. In Race 4, Axel Rahm (SWE) claimed first, setting himself at the top of the leaderboard overall, paired with his 5th place from Race 3. New faces rose to the top, with Radvilas Janulionis (LTU) sailing into second, and Eliot Merceron (SUI) in third. Rahm is in first overall with 9 points, only one point ahead of a tie for second place. Daniil Krutskikh (RUS) and Fernández each have 10 points. Racing continues tomorrow with two more races scheduled. For media requests, please contact hester@hestag.com.